of the early 20th century. The Lithuanian-born Chaim Soutine was closely associated with Expressionism and the Ecole de Paris, initially focusing on still life painting, before broadening his repertoire to include portraiture and landscapes. Influenced by modern artists like Paul Cezanne (1839-1906), Vincent Van Gogh (1853-1890), Marc Chagall (1887-1985) and Modigliani (1884-1920), he is best-known for his expressionist portraits, including: Portrait of Oscar Miestschaninoff (1923, Musee National d'Art Moderne, Pompidou Centre, Paris), and Page Boy at Maxim's (1925, Albright-Knox Art Gallery, New York). The French antique dealer and interior designer Madeleine Castaing (18941992) was - together with her husband Marcellin Castaing - an active patron of modern art and the main supporter of Chaim Soutine, during the late 1920s and 1930s, being wealthy enough to afford the high prices the artist's paintings commanded after the famous American collector, Dr Albert C. Barnes (1872-1951), bought the contents of his studio in 1923. Considering him to be one of the best artists of all time, she and her husband owned more than forty of his paintings, the largest single collection of his works. In addition to Soutine, they supported several other modern artists in Paris, and their cultural circle included such luminaries as Andre Derain (1880-1954), Pablo Picasso (1881-1973), Jean Cocteau, Henry Miller and Erik Satie. Soutine himself was a frequent guest at the Castaing's chateau near the cathedral city of Chartres. 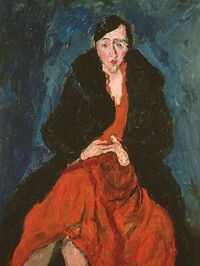 Soutine's portrait of Madeleine Castaing, which required six sittings, is entitled "La Petite Madeleine des decorateurs", after the "petite Madeleine" of Marcel Proust (1871-1922), the sitter's favourite author, whose magnum opus "A la recherche du temps perdu" (In Search of Lost Time) she read repeatedly. In the portrait, Soutine perfectly captures her regal, commanding presence. Her expensive ocelot fur coat falls from her shoulders like the mantle of a queen. Despite her authority, however, the woman's human vulnerability is still evident. Her eyes are timid, her face pinched with apprehension, and her cheeks are flushed. Madame Castaing is clearly ill at ease. Her hands twist with nervous anxiety and her head is set well down into her hunched shoulders, as though seeking the security of her coat amid the nervous excitement created everywhere by Soutine's brush marks. This portrait is a record of a psychologically charged confrontation between artist and subject. Madame Castaing is sitting close to Soutine, as is apparent in the way he has modelled the plateau across the top of her legs and the cliff of her right thigh down which her dress cascades. Overall, the image presented is of someone chic, sophisticated, accustomed to authority, yet at the same time impatient and unmistakeably vulnerable. Attributes that are enhanced by the expressionistic brushwork and colour palette. Soutine intensely admired the Dutch genius Rembrandt (1606-69). From him he derived the idea of an indeterminate background against which the figure is isolated. In Madeleine Castaing, colours are dragged over underpaint which glows through the surface. (See: Colour in Painting.) From Soutine's earlier, poorer times, he had retained the practice of painting over old canvasses which he would buy and scrape down. Madame Castaing herself was frequently sent off on expeditions through the streets of Paris to find old canvasses for the artist. "I like to paint on something smooth. I like my brush to slide", he claimed.  Young Italian Woman Leaning on her Elbow (1900) by Cezanne. Wonderful classical style painting bought by Matisse.  Portrait of Gertrude Stein (1906) by Pablo Picasso. Early painting of the Parisian art patron.  Portrait of Juan Gris (1915) by Modigliani.  Portrait of Jeanne Hebuterne (1918) by Modigliani. A painting of the artist's muse and the tragic mother of his child.  Woman in White (1923) by Pablo Picasso.  For the meaning of other expressionist portraits, see: Homepage.